Hi, I’m Silverwolf and I do gameplay stuff (some design, mostly programming) for Galacide with Puny Human. Here’s a quick look at the latest bit sequence design and a little bit of explanation of what bit sequences are, how they’re used in game, and how we make them. First, some history: When we started on Galacide we only had the randomly-generated bit wall, which is great, but we recognized a need to have specifically designed sections of bits to pair with stronger (or weaker) enemy waves and various other scenarios. The first solution we implemented for this was a volume we could place into the level (eyeballed, of course, since the bits are spawned real-time and our levels are basically empty space with pretty backgrounds). These volumes controlled which colors of bits could spawn inside them and could be stacked inside each other to create specific patterns in the bit wall, but it took an extremely long time to get them set up and perfectly positioned in the UE4 editor. The above section was a test to create a horizontal gap through the bitwall using the big volume there. 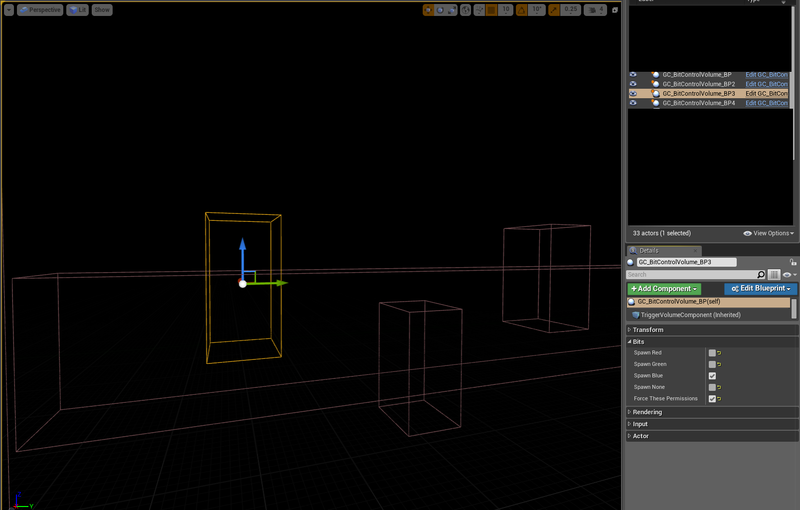 The three smaller volumes created a series of protruding bits into the gap, which the player would navigate around. 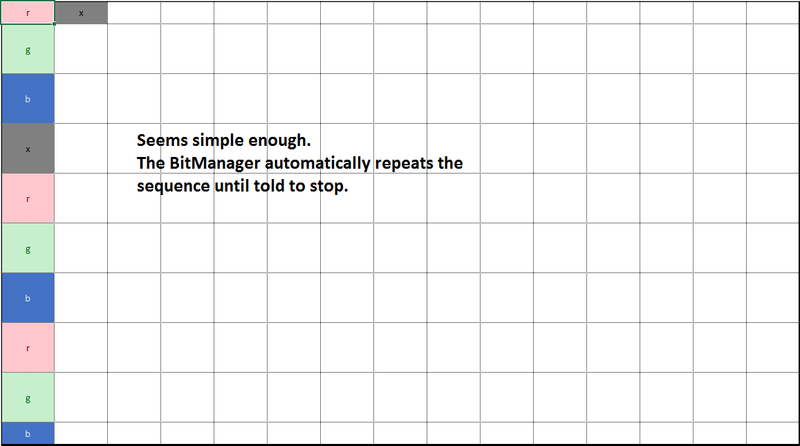 It took about 20 minutes to get the volumes in the level, and positioned (and repositioned, and repositioned, and…) until they lined up to make a 6 bit gap across the middle with 2 bit wide protrusions that left a 2 bit space above or below them. Clearly we needed a better system. 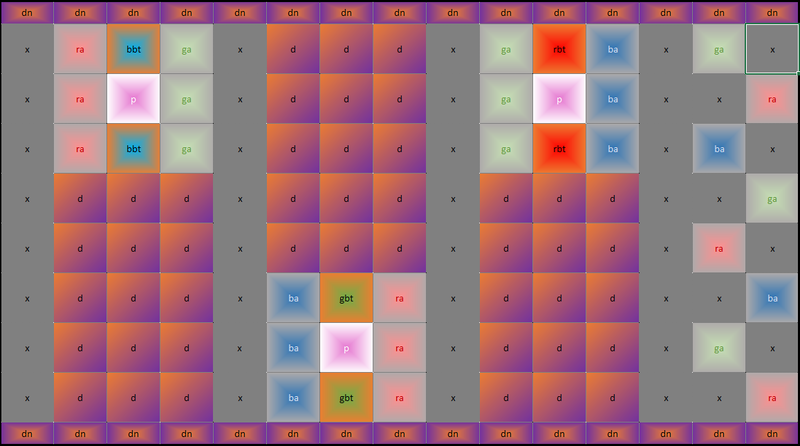 These sequences can spawn any color and type of bit, including gun turrets and linking turrets, and stationary scrap and bombs. 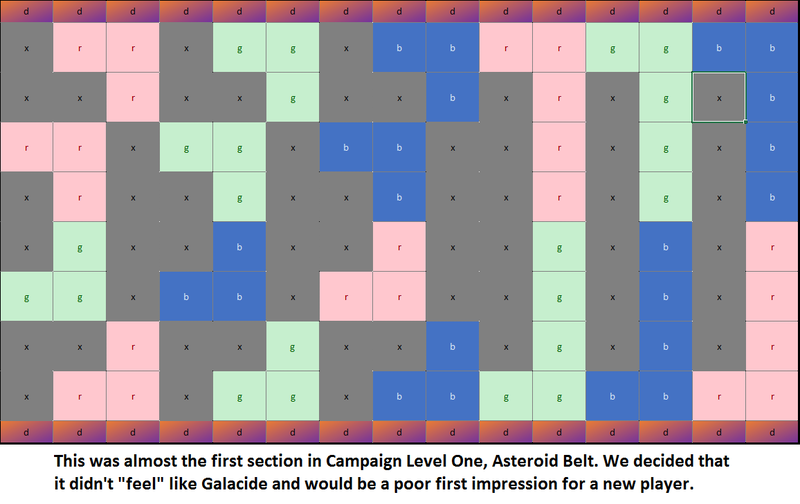 All of the Puzzle Mode puzzles are designed this way, as are any Campaign level sections with non-random bit patterns. Our initial design approach for the Campaign sequences was to just make a bunch of stuff and play it to see what’s fun. We jammed about 20 different sequences with varying levels of complexity and difficulty and stuck them in the Campaign to see what we liked and didn’t like, but more importantly, why we liked or didn’t like them. 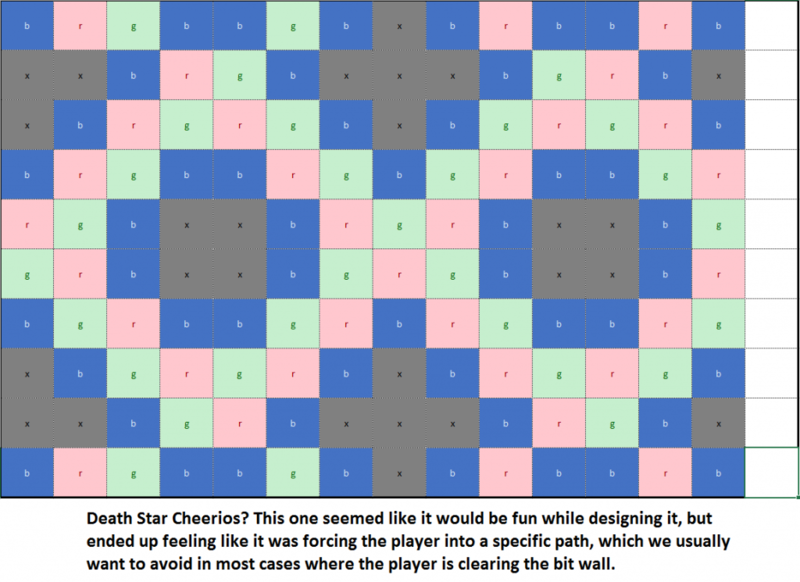 We discovered a very fine line between too easy and too hard for sequences that require matching to get through, and that navigation sequences (like the one above) should be used sparingly, and with what would normally be an overwhelming number of enemies. So that’s Bit Sequences. 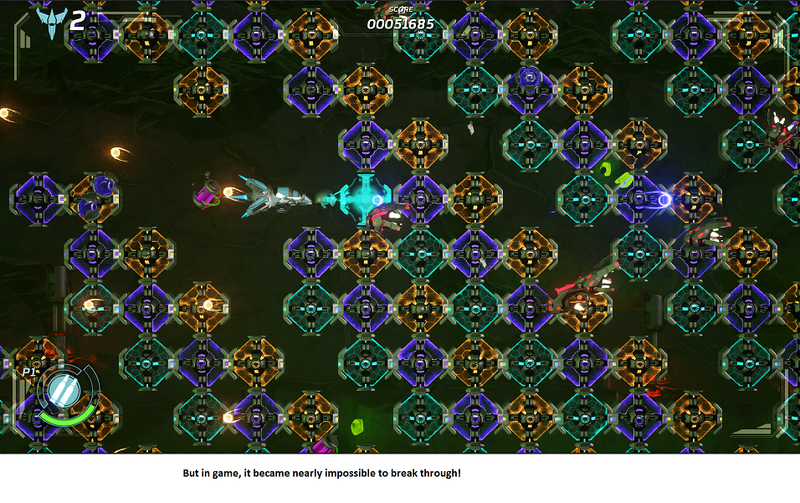 We’ve had a ton of fun designing and testing all the different ways we can challenge the player via the bitwall, and hope you have just as much fun playing Galacide as we’re having making it!